Getting there: Chocolay, Michigan: 5 miles from US-41 Harvey to Kawbawgam Road, 2 miles into Lake Le Vasseur Public Access to Parking area. Note: Snowshoeing permitted alongside of Le Vasseur Loop, Please be courteous and do not ruin groomed tracks. The Kawbawgam Cross Country Ski Trail is at the DNR entrance to Lake LeVasseur. From Harvey, take M-28 East to Kawbawgam South. What's there: The Kawbawgam Cross Country Ski Trail is located on state land, approximately 2 miles south of M-28 off Kawbawgam Road. The parking area is located on the Lake LeVasseur public access road. This trail has two loops. The beginning loop is 1.5 miles long and rated easy. 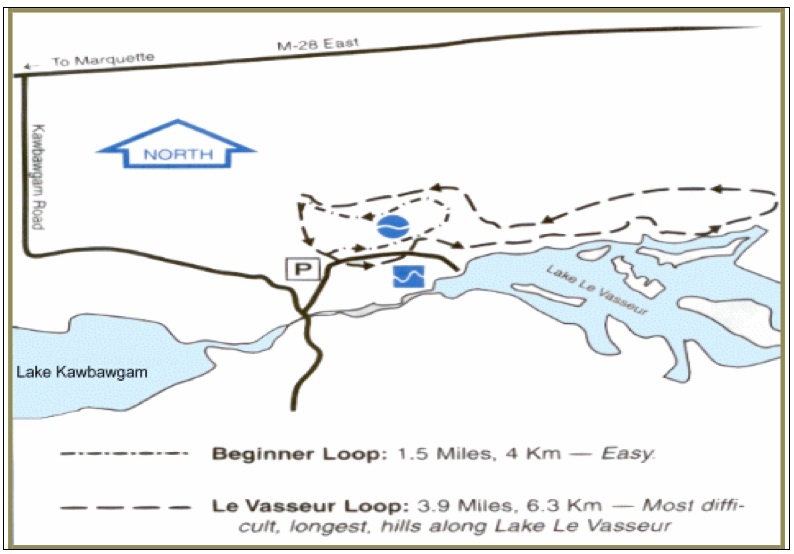 The LeVasseur loop is 3.9 miles long and rated difficult. The trail is groomed and offers views of forested hills overlooking Lake LeVasseur. The ski area is also intersected with a portion of the North Country Trail.